Glitter. Sparkle. Luminescence. 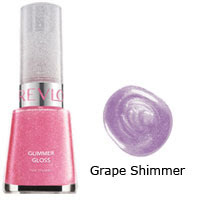 So many of these words come to mind when thinking of Revlon Glimmer Gloss Nail Enamel in Grape Shimmer. I bought this polish a few months ago, but it ended up sitting in my arsenal for awhile before pulling it out and giving it a little test drive. And may I just say, wow! I can't believe it took me so long. This polish is unbelievably shimmery and, well, glimmery. And while it comes in eight different shades, Grape Shimmer is definitely my fave. The light purple hue is perfect for lending your tips a bit of pop while still somehow remaining work appropriate. The sparkles are touched with blue, which, rather than making your nails look like you've been sitting in a 30-degree room for six hours, actually creates a sort of pinkish violet tinge. Not only is the color beautiful, the staying power is pretty unbelievable. After a week of wear -- in which I typed, opened tons of boxes, carried lots of bags back and forth to work -- my nails hadn't even chipped! Plus, it's free of DBP, Toluene and Formaldehyde, which means your nails won't be harmed in any way. And best of all? It's only $8.89! (You can purchase it here.) So what are you waiting for? You'd better glimmer and shimmer all night long! I just love the color... too want to have some more beauty products from you.